“Just what is COMSAT?” is a question one frequently hears. Many have the idea that COMSAT is a government agency, staffed by Federal civil-service personnel. This mistaken idea probably comes from the fact that COMSAT was authorized by the Communications Satellite Act passed by Congress in 1962. The basic Communications Act of 1934 made no specific provisions for satellite communication. In fact, in 1934, satellite communication was placed in the category of Buck Rogers space adventure stories, popular in the late 1930’s. 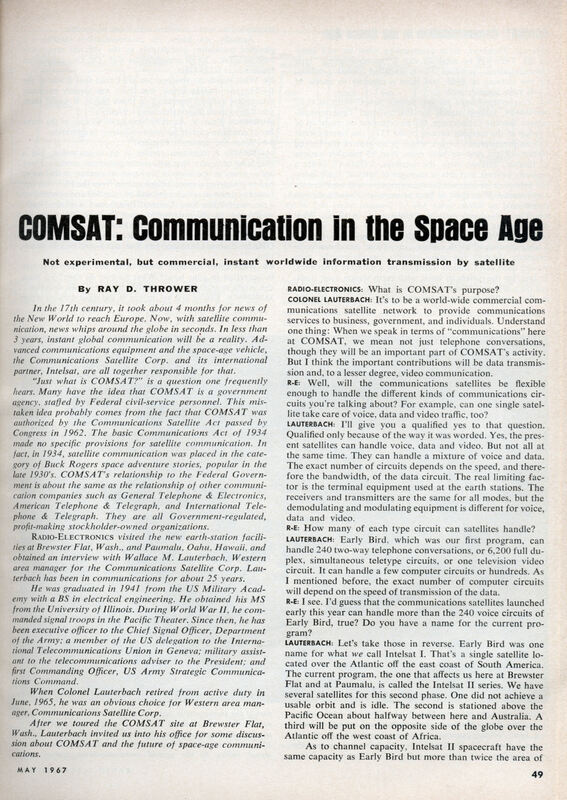 COMSAT’s relationship to the Federal Government is about the same as the relationship of other communication companies such as General Telephone & Electronics, American Telephone & Telegraph, and International Telephone & Telegraph. They are all Government-regulated, profit-making stockholder-owned organizations. Radio-Electronics visited the new earth-station facilities at Brewster Flat, Wash., and Paumalu, Oahu, Hawaii, and obtained an interview with Wallace M. Lauterbach. Western area manager for the Communications Satellite Corp. Lauterbach has been in communications for about 25 years. He was graduated in 1941 from the US Military Academy with a BS in electrical engineering. He obtained his MS from the University of Illinois. During World War II. he commanded signal troops in the Pacific Theater. Since then, he has been executive officer to the Chief Signal Officer, Department of the Army; a member of the US delegation to the International Telecommunications Union in Geneva; military assistant to the telecommunications adviser to the President; and first Commanding Officer, US Army Strategic Communications Command. When Colonel Lauterbach retired from active duty in June, 1965, he was an obvious choice for Western area manager, Communications Satellite Corp.
After we toured the COMSAT site at Brewster Flat, Wash., Lauterbach invited us into his office for some discussion about COMSAT and the future of space-age communications. RADIO-ELECTRONICS: What is COMSAT’s purpose? COLONEL LAUTERBACH: It’s to be a world-wide commercial communications satellite network to provide communications services to business, government, and individuals. Understand one thing: When we speak in terms of “communications” here at COMSAT, we mean not just telephone conversations, though they will be an important part of COMSAT’s activity. But I think the important contributions will be data transmission and. to a lesser degree, video communication. R-E: Well, will the communications satellites be flexible enough to handle the different kinds of communications circuits you’re talking about? For example, can one single satellite take care of voice, data and video traffic, too? LAUTERBACH: I’ll give you a qualified yes to that question. Qualified only because of the way it was worded. Yes, the present satellites can handle voice, data and video. But not all at the same time. They can handle a mixture of voice and data. The exact number of circuits depends on the speed, and therefore the bandwidth, of the data circuit. The real limiting factor is the terminal equipment used at the earth stations. The receivers and transmitters are the same for all modes, but the demodulating and modulating equipment is different for voice, data and video. R-E: How many of each type circuit can satellites handle? LAUTERBACH: Early Bird, which was our first program, can handle 240 two-way telephone conversations, or 6,200 full duplex, simultaneous teletype circuits, or one television video circuit. It can handle a few computer circuits or hundreds. As I mentioned before, the exact number of computer circuits will depend on the speed of transmission of the data. R-E: I see. I’d guess that the communications satellites launched early this year can handle more than the 240 voice circuits of Early Bird, true? Do you have a name for the current program? LAUTERBACH: Let’s take those in reverse. Early Bird was one name for what we call Intelsat I. That’s a single satellite located over the Atlantic off the east coast of South America. The current program, the one that affects us here at Brewster Flat and at Paumalu. is called the Intelsat II series. We have several satellites for this second phase. One did not achieve a usable orbit and is idle. The second is stationed above the Pacific Ocean about halfway between here and Australia. A third will be put on the opposite side of the globe over the Atlantic off the west coast of Africa. As to channel capacity, Intelsat II spacecraft have the same capacity as Early Bird but more than twice the area of coverage. However, we’re constructing what we call Intelsat III. That will be what we call a “multiple-access” type communications satellite. These so-called global satellites, for use starting in 1968, will have a capacity in excess of 1,200 voice circuits each. R-E: You’ve mentioned Intelsat several times. What is that? LAUTERBACH: Intelsat stands for International Telecommunications Satellite Consortium. It’s an organization made up of a group of the member nations of the ITU. the International Telecommunications Union, which is an arm of the United Nations. Right now we have more than 55 member nations in Intelsat. Intelsat owns the satellites. COMSAT holds a majority interest, and acts as manager of Intelsat. Each member nation, or its commercial representative, will own its own earth station. We expect to have as many as 30 earth stations operational by 1968. R-E: You also mentioned ”multiple-access” satellites. What do you mean by that? LAUTERBACH: Well, by using a single broadband input receiver, a large number of earth stations, say, 10 or more, can communicate through the same satellite simultaneously, even though each earth station transmits on a different frequency. In fact, for the system to work, each earth station must transmit on a different frequency. Each station is assigned a band in the satellite receiver’s spectrum so one earth station’s transmissions won’t interfere with those of another. Actually, you know, the communications satellite is a glorified translator, comparable to the vhf/uhf translators used to serve a lot of communities with TV. Our translation frequency is 2.225 GHz. R-E: What bands do you operate in? I read that it was in the 6-GHz and 4-GHz bands, but there are already so many microwave systems operating in those bands, it would seem you’d have quite an interference problem. LAUTERBACH: Exactly. Actually, you have no idea of the number of common-carrier microwave systems in operation. R-E: What are common carriers? LAUTERBACH: A common carrier is an organization, like a telephone company, that sells communications services. There are so many in operation in the bands we operate in that we’ve had to get sort of a special dispensation from the FCC that any future systems in our vicinity will be installed and operated on a noninterference basis. General Telephone Co. of the Northwest brings in the microwave relay channels that carry the COMSAT circuits out of Brewster Flat. They had to do some special engineering to get their microwave in here in the 1 1-GHz band, so as not to interfere with our 4- and 6-GHz operation. R-E: What about the case where there was already a system in operation in your band? What do you do then? I’d think this might be pretty important when it comes to site selection. R-E: You mentioned your receivers are cryogenic devices. This means they’re supercooled to reduce the natural electron noise, doesn’t it? LAUTERBACH: Yes. They’re cooled to 4° Kelvin. And that’s close to absolute zero. R-E: That should keep anything quiet! LAUTERBACH: It does a good job of it. Actually, we’re not the first to use cryogenics. Radioastronomy systems have been using them for years and many of the telemetry systems for space work use cryogenics. R-E: Besides the use of cryogenics, are there any other specific technical details in the COMSAT system that aren’t used in the usual communications system? LAUTERBACH: Oh, yes. One thing that seems to surprise quite a few technicians and even some of the younger engineers is the fact that we transmit and receive simultaneously on the same antenna. R-E: Could you explain how that works? LAUTERBACH: The technique has been used for years in microwave and vhf and uhf communications. We use what we call a duplexer. It’s a resonant-cavity device, actually two cavities, one tuned to the transmit frequency and one to the receive frequency. At the resonant frequency, the cavity represents a low impedance to any energy it sees. At any other frequency it looks like an extremely high impedance, so the transmitter output is effectively isolated from the receiver input, but the receiver can still “see” any signal that’s on its frequency. R-E: Sounds like something very useful. It lets you get away from having to build two of these “monster” antennas for each direction of transmission, doesn’t it? LAUTERBACH: It sure does. And that cuts down on the overhead. There are some microwave systems that connect as many as eight transmitters and eight receivers to the same antenna, all operating simultaneously. R-E: Whew! Let’s see. COMSAT was organized in 1962, and you launched your first satellite, Early Bird, in 1965, if memory serves me right . . . ? R-E: Then, how did you manage to get all the engineering talent together to design your systems on such short notice? LAUTERBACH: Our initial ground systems were designed and built by private contractors such as Page Communication Engineers, Sylvania, ITT Federal Labs and others. This may change with COMSAT engineers designing at least portions of the systems. Also, we already find ourselves having to provide engineering and technician advisory services to many national governments. Our transportable earth stations can be taken to remote locations and made fully operational in about 30 days and for a fraction of the cost of the large fixed station. [Since this interview, the 42-foot transportable antenna at Brewster Flat has been dismantled and shipped to the Philippines, where it has been leased for a year.—Editor] We realize that many of the countries that install these systems won’t have personnel trained. So, there is the definite possibility that COMSAT, through Intelsat, may provide the technicians and engineers to train some of the technicians and engineers of newer Intelsat members. R-E: It seems like COMSAT will be a very interesting job opportunity. I imagine a few engineers and technicians would like to work for a prestige organization like yours. LAUTERBACH: Definitely. And, with our expansion programs, we’re always looking for people with skills we can use. At a typical earth station, we need about 40 to 50 technical people. About 20% are engineers, the rest technicians. Multiply that by those 30 earth stations I mentioned a moment ago and you have a sizable work force around the world involved in commercial satellite communications. R-E: What kind of background do you look for in an engineer or technician? LAUTERBACH: Experienced communications people. We need technicians with vhf and microwave experience and backgrounds in multiplex carrier communications. Solid-state and cryogenic experience is highly desirable. R-E: Mr. Lauterbach, is a satellite communications system really necessary? Aren’t the undersea cables reliable enough? LAUTERBACH: The undersea cables? Yes, they certainly are reliable. They’ve served us well for many years and they’ll continue. But their capacity and flexibility are limited. 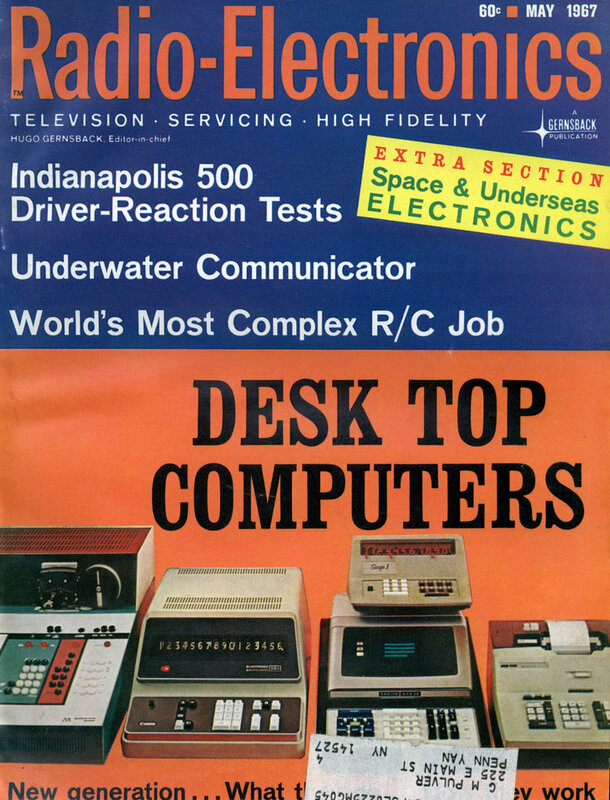 In 1960, there were only about 600 communication circuits out of the United States to the rest of the world overseas. Most of these were by cable, a few by radio. With the growth of the world’s population and the increasing business and government communication needs, we’ll need 12,000 circuits by 1980. We added 240 circuits with Early Bird. This amounted to an increase of about 30%, but the most impressive improvement is the instantaneous availability of these circuits over an area of tens of thousands of square miles. R-E: What kinds of customers will COMSAT serve? LAUTERBACH: The most often mentioned example is NASA. We’re providing just about every conceivable type communications circuit to NASA for the Apollo program. Probably one of the most interesting services we propose is to provide voice and data communication to aircraft in flight on trans-oceanic runs. R-E: Oh, I think I understand. On long over-water flights, vhf communication won’t work, and the hf radio bands are pretty crowded—and not always reliable. LAUTERBACH: Exactly. Direct communication will play an important role in air traffic control in the future, especially when the 2,000-mile-per-hour passenger liners go into service. Recent estimates show that at any given moment there are over 280 aircraft over the Atlantic alone. And don’t forget the ships at sea. We can provide them with telephone and data service to the home office. That way, if there’s a change in the price of say, oil, in a certain port, the home office can direct the tanker to go to another port where the price is better. R-E: What about the possibilities of satellite communications systems being used for worldwide educational television? Does COMSAT or anyone else have anything along these lines? LAUTERBACH: Yes. ABC, CBS and NBC have already expressed interest in this area. Certainly it would be technically feasible. Actually, when we consider the ETV aspect of satellite communications, the only thing that keeps us from doing it is “doing it.” The technology exists. The only thing still necessary is the political and economic backing. COMSAT has already outlined a program for a domestic US satellite system that would serve the major TV networks as well as handle ETV. R-E: How about computers? Couldn’t they be tied together by communications satellites? This would help in making data available on a world-wide scale. Hugo Gernsback, editor-in-chief of Radio-Electronics, in editorials for December 1959 and May 1964, urged the establishment of a “national facts center.” Using your facilities, a facts center could be international, couldn’t it? LAUTERBACH: Someone’s been reading our mail! Seriously, though, the establishment of information grids, connected by relay satellite, has already been proposed. Some authorities think that in less than 10 years a student will be able to dial a local computer on his home telephone and program problems into it. This is already being done on a limited scale, but not with relay satellites for computer interconnect. But it could be done. R-E: I’ll bet engineering firms and other businesses would benefit from being able to tie into such a system. LAUTERBACH: They certainly would. And they’d find the cost not much more than a monthly telephone bill and a lot less than owning and maintaining their own computer. R-E: Seems like you’re going to have a lot of people relying on your satellite. What happens if it goes bad after just a few days of operation? Or what if it doesn’t work to begin with? You can’t send a man up to fix it—not yet, anyway. What do you do? LAUTERBACH: To begin with, our systems are designed to minimize failure. Each component and each unit is designed and tested to meet extreme requirements. The chance of failure is pretty remote. If a failure should occur in a critical component after the bird is up, we still wouldn’t have a failure because the equipment has built-in redundancy. That means there is a parallel unit that will take over the function of the defective unit. And, if, just if, the bird should be a total failure, we do have a couple of spares we can send up. But that’s expensive. R-E: I guess you’re pleased with Early Bird’s performance. It went up in, let’s see, April of 1965, wasn’t it? And it’s still operating. LAUTERBACH: Yes, Early Bird had a life expectancy of 18 months. It’s exceeded that by quite a margin. And looks like it will keep going for a while yet. The satellites orbited this year are designed to operate for 3 years and the ones planned for Intelsat III are being designed for a life of 5 years. R-E: What is the power of the transmitter in the satellite? R-E: Six watts? But the one at the earth station is 12,000 watts! LAUTERBACH: It does seem strange, but remember that right now our techniques don’t permit a very high power-to-weight ratio. We’re limited to low-powered transmitters on the satellites. We make up for this by using the large antennas and cryogenic receivers at the earth station. Going the other way, we can transmit from earth with high power and large antennas, with their high gain, and come up with a respectable signal level for the satellite receiver. This way, we can use fairly conventional circuits for the receivers in the birds and get away from having to put huge antennas and cryogenic receiver systems in orbit. R-E: Then, actually, the complicated circuits are at the earth stations, more so than in the satellites? LAUTERBACH: In a manner of speaking, that’s true. But that isn’t to say that the circuits in the satellites aren’t up to the state of the art. Some of our equipment is far advanced from the equipment of the more conventional, earthbound systems. It has to be, because of size and weight limits. There’s a great future for satellite communications and its engineers and technicians—a future where not even the sky is the limit. Two way communications over geostationary satellites suffers from the quarter second round trip times.